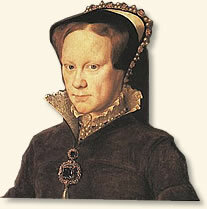 Mary was the daughter of Henry VIII and his first wife Catherine of Aragon. She became Queen of England in 1553 following the early death of her brother King Edward VI and an ill-fated plot that attempted to place Lady Jane Grey, rather than Mary on the throne. Mary was 37 when she became Queen and unmarried. She had been raised a Roman Catholic and devoted herself to reestablishing her religion as the dominate faith of the land. Protestantism was declared heresy with its practitioners subject to burning at the stake. Mary earned her nickname "Bloody Mary" as a result of nearly 300 Protestant leaders suffering this fate after refusing to renounce their religion. "She is of short stature, well made, thin and delicate, and moderately pretty..."
"She is of short stature, well made, thin and delicate, and moderately pretty; her eyes are so lively that she inspires reverence and respect, and even fear, wherever she turns them; nevertheless she is very shortsighted. Her voice is deep, almost like that of a man. She understands five languages, - English, Latin, French, Spanish, and Italian, in which last, however, she does not venture to converse. She is also much skilled in ladies' work, such as producing all sorts of embroidery with the needle. She has a knowledge of music, chiefly on the lute, on which she plays exceedingly well. As to the qualities of her mind, it may be said of her that she is rash, disdainful, and parsimonious rather than liberal. She is endowed with great humility and patience, but withal high-spirited, courageous, and resolute, having during the whole course of her adversity not been guilty of the least approach to meanness of deportment. She is, moreover, devout and stanch in the defense of her religion. Some personal infirmities under which she labors are the causes to her of both public and private affliction; to remedy these, recourse is had to frequent bloodletting, and this is the real cause of her paleness and the general weakness of her frame. These have also given rise to the unfounded rumor that the queen is in a state of pregnancy. The cabal she has been exposed to, the evil disposition of the people toward her, the present poverty and the debt of the crown, and her passion for King Philip, from whom she is doomed to live separate, are so many other causes of the grief with which she is overwhelmed. She is, moreover, a prey to the hatred she bears my Lady Elizabeth, and which has its source in the recollection of the wrongs she experienced on account of her mother, and in the fact that all eyes and hearts are turned towards my Lady Elizabeth as successor to the throne..."
This account appears in Robinson, James Harvey (ed.) Readings in European History (1906); Prescott, H. F. M. Mary Tudor (1953). "An Audience with Queen Mary, 1557," EyeWitness to History, www.eyewitnesstohistory.com (2007).